Elephant Tower, Fattehpore Sikree [Fatehpur Sikri], near Agra. bl.uk > Online Gallery Home	> Online exhibitions	> Asia, Pacific and Africa Collections	> Elephant Tower, Fattehpore Sikree [Fatehpur Sikri], near Agra. This photograph was taken by Samuel Bourne in the 1860s. 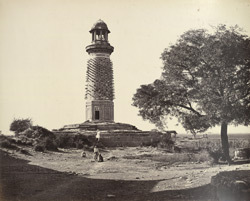 It shows the Hiran Minar or Deer Minaret situated at Fatehpur Sikri, the city built by Akbar, the third Mughal ruler of India, in the sixteenth century. Protruding from the tower are stone elephant tusks. Legend has it that Akbar’s favourite elephant was buried here, however it is more likely that it was intended to be a lamp tower and city milestone from which distances were calculated. It is twenty-one metres in height and sits on an octagonal plinth with square platform beneath.